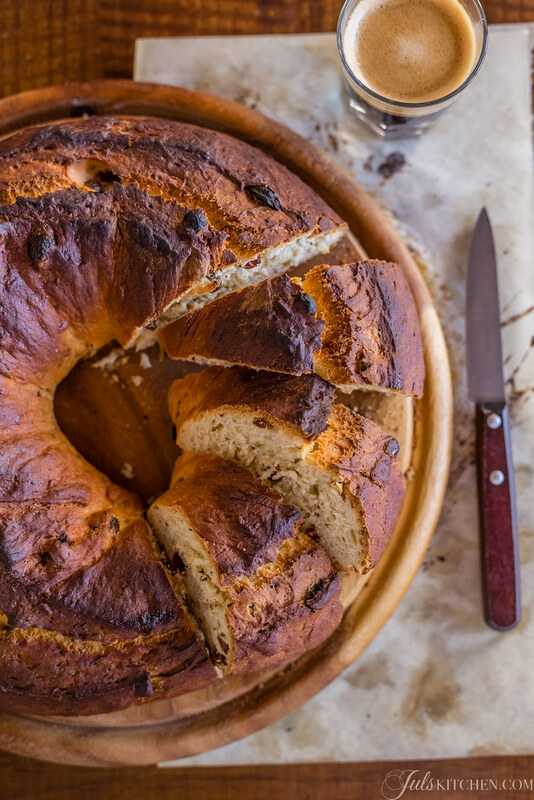 The buccellato is the typical sweet bread of Lucca, whose name dates back to the ancient Roman times, when with buccellatum they referred to the soldiers’ bread, later evolved into the medieval meaning of sweet bread. The first reference to the word buccellato appears in a 1485 document related to the process of a woman who had killed her husband with a poisoned buccellato. 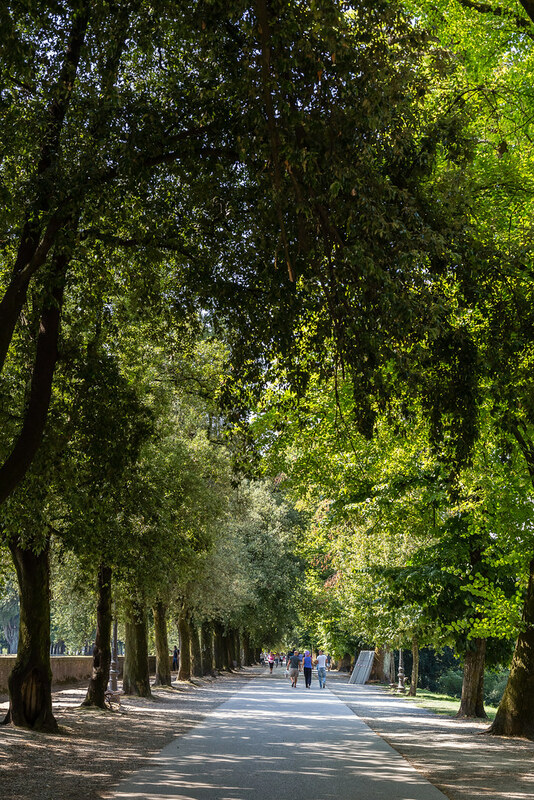 Another proof of the importance of buccellato in the history of the city is the levy that the Republic of Lucca imposed in 1578 on its sale, the money obtained from this new tax were later used to rebuild the embankments of the river Serchio. 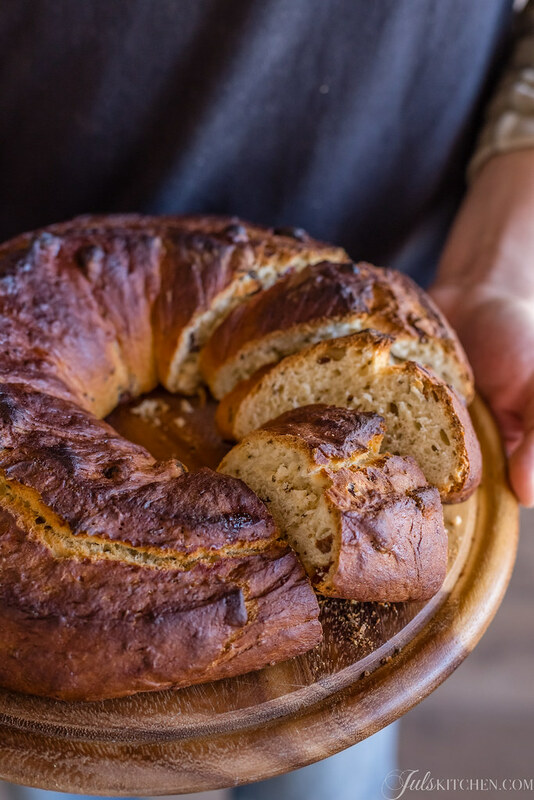 Just by looking at buccellato you can easily include it in the group of typical sweet breads enriched with nuts and sugar of the Tuscan tradition, just as pan co’ santi from Siena, the Florentine pan di ramerino or the bollo, a cake from Livorno with Jewish origins. 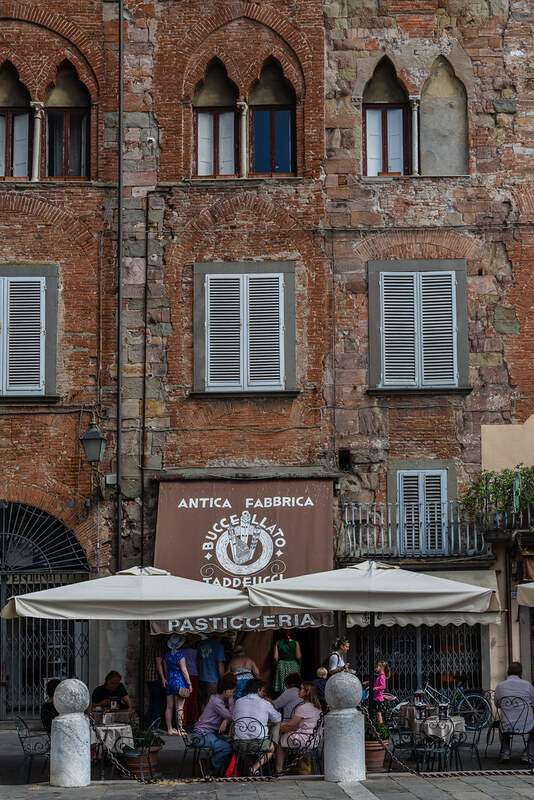 You can not say that you’ve been to Lucca if you have not tried at least a slice of buccellato, but mind you, not any buccellato would to the trick. The most famous buccellato is the one you can get in the Taddeucci pastry shop, a refined shop born in 1881. 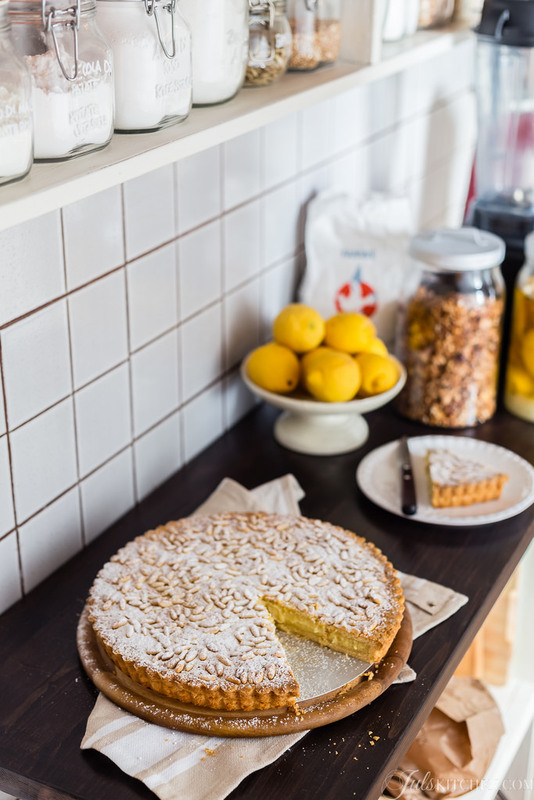 It looks like an old grocery shop, with huge shop windows crammed of desserts, cakes and sweet breads. You can easily find the shop right in the historical centre of Lucca, in Piazza San Michele, close to the homonymous church. In the past buccellato was a cake that was traditionally made, or bought, for the confirmation of your children. Today it is rightfully included in the everyday life of the city of Lucca. It soon becomes clear that the buccellato is a typical local sweet of consumed daily: just spend ten minutes in the pastry shop and ladies, young couples and old women will parade in front of you, all asking for buccellato or better yet, the same, with an affection in their voice that leaves no room for doubt. Buy it fresh daily, just like bread. 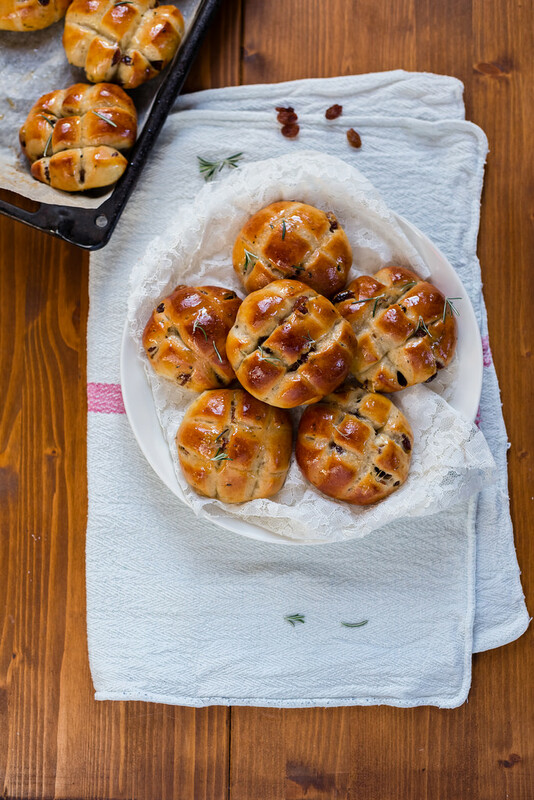 It is made just from flour, water, sugar, raisins, aniseed and yeast. 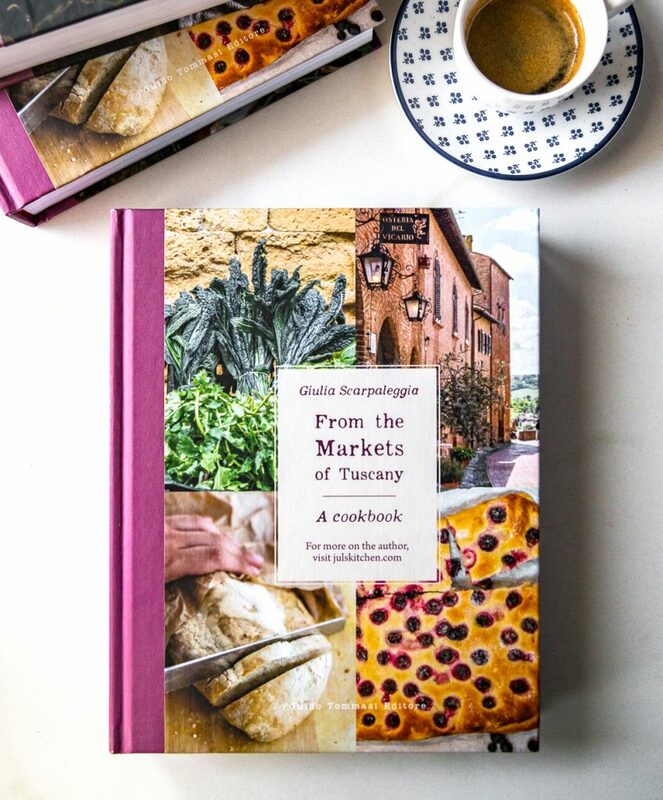 The next day, when it is no longer fresh, the heirs of Jacopo Taddeucci suggest toasting it quickly and having it with butter, coffee and milk for breakfast, or using it as a base for other sweet recipes, from a traditional strawberry soup to semifreddo. When you are there do not forget to try the torta di verdure, a vegetable cake made with Swiss chard, raisins and pine nuts. It is sweet and spiced, unusual, a light and pleasant looking dessert. So here we are, the fourth recipe of a Tuscan tour with Ventura discovering local recipes made with nuts and dried fruit. 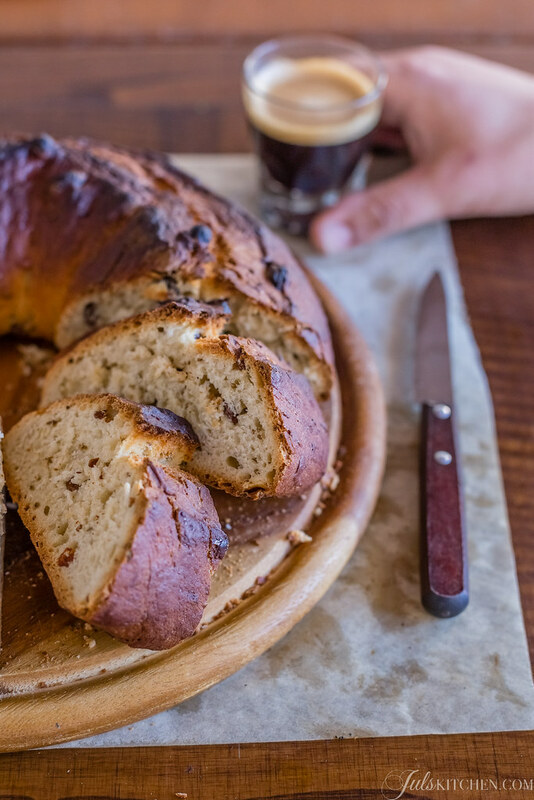 Buccellato is considered a dessert or a breakfast sweet bread, it is made with bread dough, usually enriched with sugar, raisins and aniseed, another widely used ingredient in Tuscan biscuits and sweet loaves. Today’s recipe is inspired once again by good old Paolo Petroni and his Recipes from Tuscany. Traditional Home Cooking: Yesterday’s Flavours for Today’s Taste, and it is more refined compared to the original version, which provided neither eggs nor butter. While baking an intense aniseed aroma will spread through the house. This reminds me immediately of coffee, as when I was a child my grandmother used to add a drop of aniseed liqueur to her evening coffee. 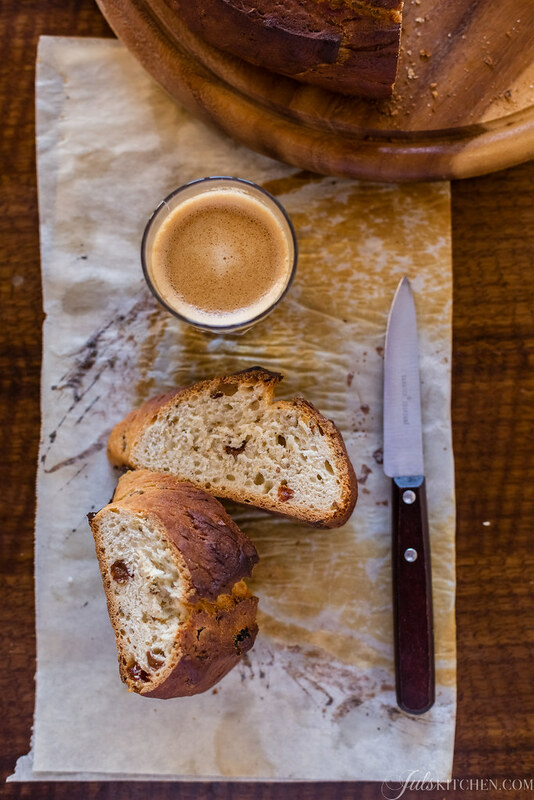 Bake this bread for breakfast with your daily mug of coffee, for an afternoon sneak with a cup of tea or make it well in advance to use when stale in a kind of zuppa inglese, with layers of thick Italian custard and strawberries washed in red wine. Pour the flour and sugar in the bowl of a stand mixer. Dissolve the yeast in a cup with half the water, then pour it in the bowl and knead on low speed with the dough hook, adding gradually the remaining water. When the dough has completely absorbed the water, add the egg yolk and the butter cut into small pieces. Knead on low speed until the dough becomes smooth, but still slightly sticky. Add eventually the aniseed, the squeezed raisins and salt and knead just enough to get them incorporated in the dough. With oiled hands, remove the dough from the bowl and collect it on a well greased wooden board. Form a ball and place it in a bowl previously drizzled with olive oil. Cover the dough with a damp cloth and let it proof for about three hours in a warm place. After this time, slide back the dough onto the oiled wooden board, knead it gently and form a long thin sausage. Line a baking sheet with parchment paper, place a cup in the centre and wrap the dough around it, then seal together the ends to form a donut. Cut the dough all the way around, so that it will rise better, and let rest for at least an hour. Preheat the oven to 180°C (350°F - gas mark 4). Melt the sugar into the hot water to make a syrup, then pour it over the egg white and beat with a fork until frothy. Brush the buccellato with the syrup of water, sugar and egg white and bake for about 45 minutes, until golden brown. Let it cool completely before slicing. 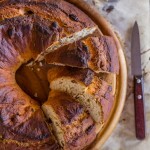 Often in Tuscany we add raisins in cakes, biscuits and sweet breads. We are more reluctant to use it for savory preparations, as it happens in other parts of Italy, influenced by the Arab culture or the Middle East cuisine. In Sicily raisins are used to make a pasta with broccoli and a Christmas caponata, in Naples they are used in a pizza with escarole, while in Veneto raisins are one of the ingredients of a risotto and of spinach patties. Among my favourite dessert recipes with raisins there are of course the Tuscan castagnaccio, a chestnut cake, and the Florentine pan di ramerino, while among the savoury recipes I am partial to this very old recipe published nearly seven years ago, the sweet and sour stewed peppers, a recipe which was passed on by my grandmother, my aunt and an unknown benefactor of Rionero in Vulture, in Basilicata. Will definitely be making this bread. The sweet bread from my region is Pinza Triestina. Amo suas postagens. Muito obigada. Ciao Adelina, I know I’ve not been clear enough! check the photos: you must carve the buccellato on the surface, all around. And yes, remove the cup, I forgot to add this! My grandmother used to make this at Christmas over 60 years ago. Will make it in a few days. oh fabulous! it is a very festive cake! I remember buying and eating this bread when I stayed in Lucca for 3 weeks in 2015. I was happy to find the recipe. The bread turned out delicious and brings back those happy memories. Thank you so much. Glad you liked the buccellato at Taddeucci, you make me long for a visit to Lucca now! Let me know how it will turn out! I am back in USA and made Buccellato. It turned out really really good. My husband liked it a a lot. I added one more egg to the recipe and 1/8 tsp anise extract and a little brandy when I soaked the raisins with little water. I used this same liquid to mix with the egg whites and sugar wash to brush the dough before baking. I made two loafs same size as they sell it at Taddeucci Bakery at Lucca for 4.50 euros. I used the baguette loaf baking pan, convection oven at 375 degrees F for the first 6 mins and turned it down to 325 degrees F and baked it for 35 mins total with internal temp of 190 degrees. It turned out dark caramel in color with good texture and crumb. I have to cover it with foil halfway since the crust was getting brown a bit fast for me and removed it last 10 mins. Thanks for sharing recipe. I will make again for Thanksgiving. Grazie, Ciao! Thank you so much for your feedback, so happy you baked it! I am looking to buy buccellato. Do you ship it and if not do you know who I can contact. Contact Buccellato Taddeucci in Lucca! I am trying this recipe as my Grandmother always made it and my family loves it. My grandparents were from Banja de Lucca. I had another recipe but it was just okay. My concern is that it seemed so dry in the stand mixer and it didn’t rise much. I measured very carefully but I’m worried something is off. Hello Stephanie! the ingredients are all there, I took this recipe from a traditional Tuscan cookbook. Have you tried using a scale for the grams? sometimes it makes such a difference!